FileSplit is a java application that allows to split a file (this file is not modified) in a number of smaller files, specifying the maximum size for each of this chunks. Its main application is, or at least it was my purpose, to be able to save a big file in some floppys, to carry them out. It is an AWT application, written in 1997, without the nice appearance brought later by Swing. FileSplit is available in a .jar file, that must be appended to the classpath. SplitFile is a java file compiled with JDK1.1.4; to use it, you must have a java virtual machine 1.1.x: the JDK 1.1.x or the JRE 1.1.x (the java rutime environment), for example. 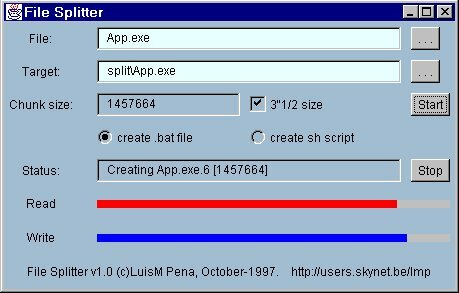 SplitFile is freeware. There is no warranty in the program, but you can use with complete freedom, or or modify it, as the source code is available as well. source code: SplitFile.zip (30 KB). It compiles with JDK 1.4 showing some deprecated API usage. The target path; where to create these chunks; these chunks will have the name targetpath.X, being X the chunk number. Maximum size for each chunk. To make easier the use of Split File, it uses -only in the window interface- a settings file. This file is stored in the directory given by the HOME property, with the name SplitFile.properties. Without arguments: it presents a window interface to get the parameters needed.